Few things are more disappointing than coming home from a hunt empty-handed. Hunters of all stripes spend the year eagerly anticipating deer season, and closing out the season without bagging a buck or doe can prove immensely aggravating. Fortunately, arming yourself with the right knowledge can increase your chances of having a fruitful deer season. Hunters determined to go home with a cooler full of fresh venison should put the following pointers to good use. Since a deer’s eyes are located on the side of its head, it has a solid 310-degree view. Luckily, a crafty hunter can use this to his or her advantage. Staking out a position in an area that breaks up your outline can prevent your prey from fully making you out. Palmetto State residents interested in South Carolina deer hunting are sure to appreciate the many fortuitous hiding spots found on Cedar Knoll’s land. Deer are most active during daylight hours, so it’s in your best interest to track your prey while the sun is still up. In fact, in many states, it’s illegal to hunt deer before the sun rises or after it sets for the day. In addition to being incredibly dangerous and potentially illegal, hunting without the sun isn’t liable to produce favorable results. You’ll need to be as quiet as possible when stalking your prey. Whenever possible, avoid stepping on twigs, branches, and other sources of woodland noise. Tearing through the woods with wild abandon is practically guaranteed to send any nearby deer packing. 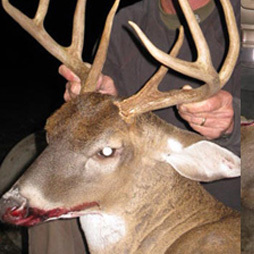 Even though deer are plentiful during deer season, not every hunter is guaranteed to bag one. However, there are several effective ways to decrease your chances of disappointment. Utilizing the tips discussed above can exponentially increase your likelihood of bringing home a nice big buck. This entry was posted in Uncategorized on December 30, 2016 by 15803827. With deer season finally upon us, there’s no better time for hunting enthusiasts to head out and bag some venison. However, as is the case with any type of hunting excursion, deer hunting should be done with the utmost caution. Failure to take safety into account during your hunt can result in serious injury — or worse. To reduce your risk of falling victim to an unfortunate accident, put the following tips to good use. It’s in every hunter’s best interest to avoid hunting alone whenever possible. Having one or more hunting mates will ensure that you’re immediately tended to if you become injured. Additionally, the more people present, the less likely you are to get lost. South Carolinians looking for group-based SC deer hunting are sure to love the guided hunts offered by Cedar Knoll. If it’s been a while since your last hunt, give your hunting rifle a thorough cleaning and inspection before heading out. If you’re unclear on how to do this, take the rifle to a local firearm specialty shop. Not only will the people there perform basic maintenance for a reasonable price, they’ll educate you on how to do it unassisted. Many deer hunters opt to use tree stands to give themselves a better view of the surrounding area. Keep in mind, however, that these stands have a tendency to weather with age, so before settling into your favorite tree stand, confirm that it’s perfectly sturdy and capable of supporting the combined weight everyone who intends to occupy it. Hunters all over the country look forward to deer season all year. Unfortunately, shrugging off personal safety can put a tremendous damper on a long-awaited hunting trip. In the interest of preserving your safety — and the safety of your fellow hunters — avoid hunting alone, keep your rifle in good shape, and frequently test your tree stands for sturdiness. This entry was posted in Uncategorized and tagged SC deer hunting on December 15, 2016 by 15803827. If you’re new to hog hunting, successfully bagging a wild pig may seem like a daunting prospect. After all, hogs tend to be a little more combative than deer and other commonly-hunted animals. However, provided you familiarize yourself with some valuable pointers, you should have no problem staying safe on your next hog hunt. Hunters interested in taking home a wild pig with minimal hassle can benefit from the following tips. Wild pigs are more likely to attack hunters than deer — particularly after they’ve been shot. Furthermore, if you’re unable to land a clean shot through the heart, a single bullet won’t be enough to take a hog down. Once the animal has been wounded, there’s a good chance it will try to retaliate (if it can figure out where you are), so when hunting wild pigs, multi-shot high-powered weapons and high-velocity ammo are essential. Sportsmen who enjoy South Carolina hog hunting are urged to stay a safe distance from their prey. Even after the animal’s been shot, it’s in your best interest not to get too close, as wild pigs have a propensity for playing dead and attacking when hunters approach. Some hogs carry a plethora of potentially fatal diseases and bacteria. In preparation for your first hunt, it’s recommended that you familiarize yourself with the telltale signs of hog disease. If a pig carcass exhibits any of these signs, abstain from handling it or eating its meat. Embarking on a hog hunt can prove dangerous for those who fail to exercise the appropriate amount of caution. Fortunately, taking the previously-discussed pointers to heart can be a boon to your personal safety. If a safe and successful hog hunt is what you’re after, have the right weapons in hand, maintain a safe distance from your prey, and keep an eye out for signs of hog disease. This entry was posted in Uncategorized and tagged South Carolina hog hunting on December 1, 2016 by 15803827.